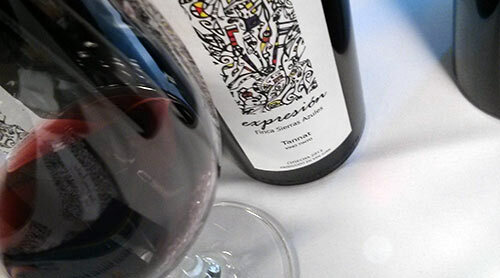 While blasting through San Francisco in September and enjoying bruschetta at Biondivino, I stopped in at a one day tasting of wines from San Juan, Argentina. In general, most Argentine wines I find are from Mendoza and so expanding the Argentine horizons is always on the table for me. It was a relatively small tasting of maybe 15-20 producers in one room of the Parc 55 hotel. I seemed to have arrived at an hour of desolation as there were maybe 10 other people with me there and a whole lot of bored winemakers as well as interpreters. After an hour or so, this changed, but it gave me that rare and often impossible moment at trade wine tastings to talk with people a bit more while not having my elbows jostled as people trying to slip under me for a pour–seriously, it happens, a lot. Unfortunately this moment was a bit lost as despite speaking in Castilian with the representatives, I found that they were either the winemakers who would go on and on about some lengthy spiritual quest to find the true meaning of their wines and 100ha vineyards. Or then they were some greasy sales guy who knew nothing. For those who don’t know, San Juan has vineyards at quite high elevations. Unfortunately these are not small vineyards and some of the wineries present make millions of bottles each year. They also make great use of the Tannat and “Bonarda” grapes the latter of which, while being heavily used few seemed to know where it was from originally and those who thought they did swore it was Italian when in actuality it’s French and called Douce Noir. This aside, there were two cellars that gave me something to mention. The first was Alta Bonanza de los Andes. They farm organically with vineyards at 4-6,000m and it shows as all of their wines had a more fresh and pure quality to them than most of the larger cellars did. Specifically their 2013 Bonarda red spoke to me. Rich and aromatic it had a great mouth feel, a good brace of tannins and a general fullness to it. It was also one of the best examples of Bonarda to be found at the tasting as many were just “rugged” to put it nicely. The other winery of note for me was Finca Sierras Azules. Situated at the rather jaw dropping altitude of 6,100m (I still can’t believe that’s not a typo) they brought their Expressión line of wines. As is typical in New World bottles, they were mostly all varietal wines and the 2013 Tannat didn’t work for me as it tossed out ferric notes that I often find are the case in Catalonia as well and why I’m not fond of this grape on its own. The 2013 Syrah was quite nice though showing some surprising mineral notes, smoothness to the texture and a balanced, lingering finish. While this tasting was for the trade, it was obvious that it was more for the restaurant trade as the price point on these bottles were what attracted many of the other attendees. For me, more exploration of the region will be needed at some point to find smaller producers.